When Dan Pfeiffer, Senior Advisor to President Obama (now co-host of the popular podcast Pod Save America), shut the door to the Oval Office for the last time—closing the chapter on our first African-American President, and leaving the highest office in the land to Donald J. Trump, racist and reality TV star—it was more bitter than sweet. 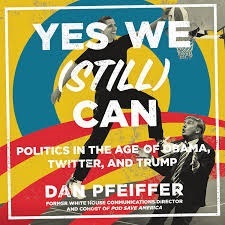 Pfeiffer tells the story of his fascinating years serving President Barack Obama and gives his take on many subjects including how Democrats can win back the Oval Office in his smart, witty, revealing new memoir YES WE (STILL) CAN: POLITICS IN THE AGE OF OBAMA, TWITTER AND TRUMP, an irreverent, no B.S. take on the politics of our time. 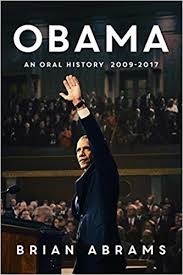 Pfeiffer will be joining Halli at her table, Wednesday, July 25, the podcast posted 3 pm ET at Halli Casser-Jayne dot com, along with author Brian Abrams whose new book is OBAMA: AN ORAL HISTORY 2009-2017. On November 9, 2016, Dan Pfeiffer, like many of us, woke up wondering WTF had just happened. How had Donald Trump won the White House? How had a decent and thoughtful president been succeeded by a buffoonish reality TV star, and as many of us wondered, asked himself: What do we do now? But instead of throwing away his phone and moving to another country, which he admits were his first and second thoughts, Pfeiffer decided to tell to tell his surreal story, recounting how Barack Obama navigated the insane political forces that created Trump, explaining why everyone got 2016 wrong, and offering a path for where Democrats go from here. In his new book YES WE (STILL) CAN. Obtaining unprecedented access to Obamaworld, interviewing aides and advisers in the administration and on the campaigns as well as several elected members of Congress, both Democrat and Republican, journalist Brian Abrams set out to compile an oral history of Barack Obama’s presidency. The result is his book OBAMA: AN ORAL HISTORY 2009-2017 an immersive chronology of the politics and governing behind a landmark American presidency, manna for those who revere President Obama and even those who do not, certainly an important read for all historically minded. Offering behind-the-scenes stories, this amazing compilation illuminates the inner-workings of an administration through more than one hundred exclusive interviews with senior staffers including Jon Favreau, David Axelrod, Rahm Emanuel, Valerie Jarrett, and David Plouffe; cabinet members such as Leon Panetta, Jack Lew, and Arne Duncan; and key lawmakers: Barney Frank, Chris Dodd, Joe Lieberman, Scott Brown, and Barbara Boxer, among many others. Dan Pfeiffer, Pod Save America, Brian Abrams, President Barack Obama, Donald Trump, Democrats, Republicans, politics, history, books, authors — we have it all for you on The Halli Casser-Jayne Show the new podcast posted Wednesday, July 25, 3 pm ET at Halli Casser-Jayne dot com.